Washington Redskins safety Montae Nicholson (35) takes the field before the game against the Dallas Cowboys at FedEx Field on Oct. 21, 2018. 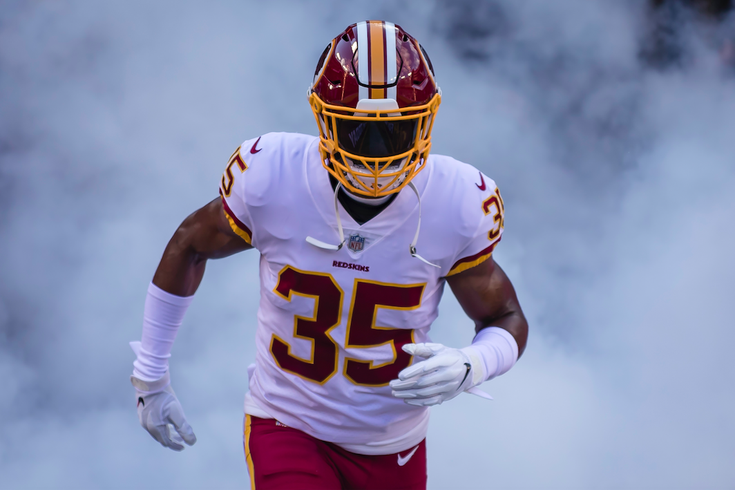 Washington Redskins safety Montae Nicholson is facing assault and battery charges stemming from a Tuesday morning altercation in Virginia, authorities revealed Wednesday. A second-year player for Washington, Nicholson was arrested in connection with a video of a street fight that occurred near Leesburg in Loudoun County. The video, obtained by TMZ, allegedly shows Nicholson, 23, and his girlfriend, Sydney A. Maggiore, 24, fighting with two other people in middle of the street. The alleged road rage incident reportedly happened after Nicholson and Maggiore, who were in a car together, honked at the other unidentified couple's vehicle. A verbal dispute followed and allegedly escalated, according to the Loudoun Times-Mirror. The other man and woman involved were hospitalized with serious but non-life-threatening injuries. An investigation into the circumstances of the fight remains ongoing. Nicholson was released from jail after posting bail. Maggiore, who was charged with malicious wounding and assault and battery, remained in jail on Wednesday. She is believed to have struck the other woman with a bottle. Redskins head coach Jay Gruden said Wednesday that Nicholson will not play in Saturday's game against the Tennessee Titans. The team has not yet made a decision on disciplinary action. The fight comes after the team faced criticism for claiming ex-49ers linebacker Reuben Foster off waivers, days after Foster had been arrested and charged with domestic violence.